In my last post I have explained a little bit Journal and Repository Volumes. If you know what those volumes as used for, you are aware that Journal Volumes hold poin-in-time history of the data. And in this short entry I would go a little bit into those point-in-time history. In other words – a snapshot is the difference between one consistent image of storage data and the next. In synchronous replication every write is a single snapshot. In asynchronous replication the RPA gathers several writes into a single snapshot (you can actually adjust that within the configuration. Now, let’s get back for a second to EMC RecoverPoint – Introduction. As you know, the replication can be local or remote (or both!). Now, each Replica has its own Journal, so if you have same customer data replicated both locally and remote, you can have different policies for those two! For example synchronous replication for local protection and async replication for remote one. Bookmark – a bookmark is a text label that is applied to a snapshot. In other way if you wish to manually create a snapshot and name it – boom, that’s it – you have a bookmark. You can create those if you need to have a specific point-in-time, e.g. right before the application upgrade, or right before the maintenance break etc. As you can see on above print-screen, we have an example list of Snapshots, some of them have names, which makes them Bookmarks. Simple as that. RecoverPoint architecture consists of components such as RecoverPoint software, Appliance, write splitters etc. In this post I would like to give you a quick introduction to those components. To understand how RecoverPoint actually works first you have to understand all the small building-blocks of the RecoverPoint System. EMC RecoverPoint is appliance-based – which makes this solution highly scalable. RPA can be a physical appliance (RPA) or a virtualized RPA (vRPA). RecoverPoint RPAs manage aspects of data protection and replication. 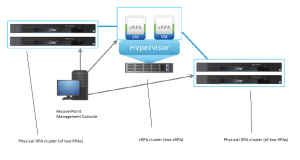 The virtual RPA is a purely software-based instance of the RPA appliance, and utilizes services on an existing ESX platform – vRPA requires no other hardware compontents beyond the ESX server cluster it is deployed on. RPA (RecoverPoint Appliance) has dedicated Fibre Channel, WAN and LAN interfaces. Management is used to manage the RecoverPoint System. RecoverPoint Write Splitter is used to split (duplicate) the writes. A write is sent first to the RecoverPoint appliance and then a duplicate is sent to the primary storage volume. It is important to understand that Write Splitter is Array-Based. It means that you don’t have to actually connect RecoverPoint Appliance between host and a Storage Array – instead a host is communicating with Storage Array directly, not even our of a RecoverPoint instance. Write Splitter is already built-in to the EMC VNX, VMAX, VPLEX storage systems. A RecoverPoint System is a logically single entity which replicates and protects data between all sites in one RecoverPoint installation. You can manage all RPAs through a floating cluster Management IP address. A system is a set up to 5* interconnected RecoverPoint Clustes managed via a single RP management console. (*5 clusters for RecoverPoint/EX and RecoverPoint/CL licenses, RecoverPoint/SE supports up to 2 clusters). RecoverPoint System of three RPA clusters. The number of RPA clustes included in a RecoverPoint systems usually depends on how RecoverPoint is used (local protection only/ local and remote protection / remote protection only).